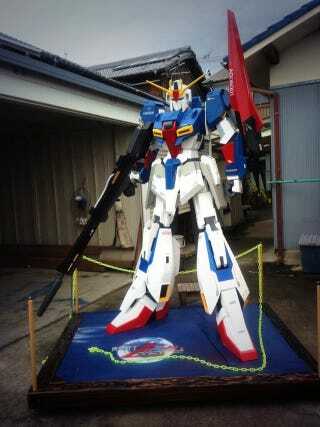 In Hyogo Prefecture, Japan, 66 year-old Kenichi Okada began building a 2 meter tall Z Gundam statue for his grandchild. He spent eight months working on the statue, which weighs 40 kilograms. According to Yahoo! Japan, the child didn't show much interest in the result. Okada built the Gundam out of wood, which made creating the rounded sections of the Gundam tricky. Since the grandchild wasn't impressed, Okada decided to display the Gundam in the lobby of the agriculture co-op where he works. The image of this Z Gundam debuted last fall on Twitter, and it was retweeted over 16,000 times. Hey, even if that kid wasn't impressed, the internet sure was—er, is.